There are so many items to consider when it comes to finding the best glass solution for your space. Today, glass suppliers carry a multitude of coatings and tints-weaving the newest technology into everything they do. At Grabill, we work to ensure that our client's vision comes to life-even when it comes to glass specification. 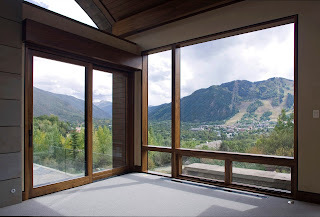 There is a world of possibility when it comes to glazing options for the modern home – but smart glass “clearly” looks to be a leading choice. Clean lines, minimalist style and awe-inspiring views are the perfect backdrop for smart glass. The latest product is self-tinting. No need for electrical components or wires – this is a thermochromic technology that uses the suns intensity to continuously transition the glass. Much like transition lenses – just on an extremely large scale. The technology can be used on single, double and triple pane glass and can be combined with different Low-e coatings to provide optimal energy efficiency. Standard glass contains a level of iron oxide that gives the glass a greenish hue. For those who desire the most impeccably clear glass on the market, Grabill Windows and Doors has the perfect solution. Low-iron glass...allowing for astonishingly clear, flawless glass in any of our custom products. Self-cleaning glass is just one of the limitless options available on a Grabill custom window or door. This unique glass consists of a titania based coating that sheets rain water containing dirt away, and it also chemically breaks down dirt when exposed to UV light. Minimal maintenance is required for such glass, as nature itself does the cleaning through precipitation and sunlight. Switchable privacy glass is the perfect solution for areas of the home, such as: bathrooms, shower enclosures, home theaters-and more. This innovative glass actually transforms from transparent to opaque with the flip of a switch. Privacy glass is available in cutout, curved, and shaped pieces-and can be incorporated into our custom windows and doors.